6 Best Benefits of Meditation That Will Make You Meditate Daily! 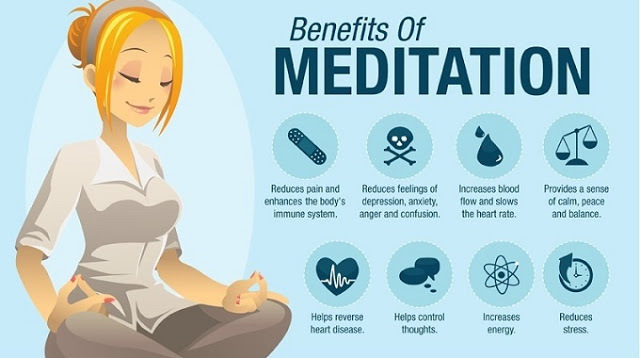 Home » Meditation » 6 Best Benefits of Meditation That Will Make You Meditate Daily! We all know meditating is good. But do we know exactly what benefits meditating would bring about to our day to day life? Meditating makes you feel relaxed and it does truly relaxes your body. And this relaxations bring about a few indirect benefits. One such benefit is a stronger immune system. Stress and anxiety wreak havoc with our immune system, leaving us susceptible to all kinds illnesses, particularly during the winter. Regular meditation reduces the levels of stress-related chemicals in our body, and also leaves us less likely to turn to unhealthy coping strategies to deal with the stress. Stress can also affect our fertility. Besides, you might have seen many cases of babies dying before they even see the light of this world because of their mother’s stressful conditions. Doctors always advice mothers to be relax and not to be stress when they are pregnant. According to WebMD, scientists aren’t sure of the exact link between stress and fertility issues, however, test subjects that took part in stress-reduction techniques were more likely to get pregnant. Stress can cause heart disease to auto-immune conditions such as IBS. Meditation alone cannot help cure any of these. However, good food coupled with a relaxed mind can definitely help cure/prevention process. Mind and body is deeply connected resulting the status of our mind to determine the status of our health. Meditation increases self acceptance. It also works to build our self-esteem. When we meditate we deal with our negative thoughts about ourselves. It helps us deal with same condition outside of meditation too. Meditation help improve our relationships in 2 ways: Firstly allowing us with time to reconnect with our relatives. The more relaxed, grounded and self-accepting we are, the more we are able to be our best selves with other people. Secondly, meditation helps develop our awareness around our relationships and start noticing thoughts and feelings about ourselves helping us deal with them better. Meditation can help you relieve pain. 2011 MIT study showed that meditation might be effective for pain relief. In the study, subjects trained themselves to focus on physical sensations from certain parts of their bodies, leading researchers to believe that people who suffer from chronic conditions could be able to train themselves to “turn down the volume” on pain. Have you gained any benefits from meditating? How has it helped you? Share your thoughts as a comment.